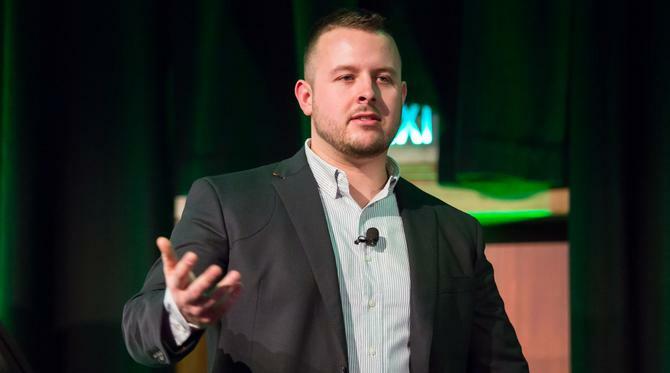 If there’s one takeaway President Trump’s lead data scientist, Matt Oczkowski, can offer brands after working on the Republican candidate’s election campaign, it’s that they need their own walled garden. “I encourage all corporate entities to move more towards a walled garden approach to their data and modelling,” the Cambridge Analytica data scientist said at this year’s ADMA Data Day, as well as during an exclusive interview with CMO. “This is something Google and Facebook have mastered for a long time. They’re never going to give you data outputs from their pools, you have to buy it through marketing. By contrast, if there’s one thing Oczkowksi is certain will disappear from the digital marketing landscape, it’s programmatic advertising. “I fundamentally believe programmatic media buying is dying and will go away,” he claimed, noting more than half the total digital dollars spent on media by the Trump campaign was on Facebook alone. Building up internal first-party data sources are key to following customer experiences all the way through, Oczkowski said. “And that’s not just online, append it offline, because it gives you a much more robust view of the customer,” he said. Cambridge Analytica was brought in less than six months before the US presidential elections to help the Trump campaign secure a win. The big data consultancy firm has a history in political campaigning, but also works in the corporate sector and defence. Oczkowski said politics is a great vertical because it’s “forced innovation”. “There’s no truer startup than a political campaign. You have between six months and two years to build a multi-person organisation, spend hundreds of millions of dollars, but at a definitive end date you need to win 51 per cent market share in your vertical,” he said. In the case of the Trump campaign, Cambridge Analytica’s first task was to build the appropriate database infrastructure to collect, ingest, match and de-duplicate data from disparate sources. The focus then shifted to three business objectives: Fundraising; persuading votes to vote for their candidate; and drive more people to the polls (known in the US as ‘GOTV’, or get out the vote). To do this, the team leveraged three pots of data: Political data, such as voter history; publicly available data from Experian, Acxiom and others on consumer purchase trends, demographics, geography and so on; then its own growing pool of first-party data based on polling, market research and modelling results. In all, between 1000 and 5000 data points were used for each US adult. With Trump, the data science approach then needed to be based on the type of candidate Cambridge was working for, Oczkowksi said. A cornerstone of building the Trump campaign’s first-party data sets was research and polling, and the team conducted 800,000 live and online surveys across 17 battleground states during the campaign period. Results influenced data modelling, which informed segmentation and media buying. Insights from these activities were then fed back into the machine. Through this, the team built custom tools like ‘path to victory’ calculators, showing the optimised paths to reach 270 votes in the US, as well as ‘cities to visit’ calculators. One of the challenges many organisations are grappling with actioning data insights. Oczkowksi said this wasn’t too much of a problem for Cambridge Analytica, because the Trump campaign was run as a business. A key reason Oczkowski believes he was able to see the pending outcome of the election, when the wider media and Hilary Clinton camp did not, was because of the data collected on people donating to the Trump cause. Many were individuals who hadn’t donated to the Republican party before. Notably, Trump raised online low-dollar contributions of US$240 million, the most any presidential candidate has raised from low-dollar sources. “The most difficult thing a data scientist has to do is predict who is going to turn out in an election,” Oczkowksi continued. “To do this, the only data most people have is past election voting history- because you showed up at the last three elections, people make an assumption based on basic modelling that you’ll show up again and vote. “There was a massive, hidden tranche of Trump voters that came out and no one, besides a few people, had the data to show that was going to happen, or to reinforce it. Oczkowski said he’s often asked why Hilary Clinton’s massive data science team saw something different to what Trump’s team saw. The answer is in the data. “Hilary had her own data, which showed typical Democrats who come out to vote at this time. We were collecting interesting data points that told us a different story,” he said. It was also data modelling that allowed Trump’s data science team to recognise consumers lying publicly about their intention to vote for the controversial candidate. “We noticed specifically with live people calling cell phones that 3 per cent of people were lying because they were embarrassed to admit they were going to vote for Trump to a live caller,” he said. “We’d have a score of 90 out of 100 in our database for them, they’d say they’d vote for Hilary and we’d just know that wasn’t the case, the signal was too strong. So we reweighted our modelling to account for that. None of this, however, takes away from the importance of brand and creative. Oczkowski pointed out that for every piece of content produced during the campaign, the team also pitched a big overarching brand narrative next to it. “Trump wasn’t a policy candidate talking about intricacies of healthcare policy. It was about widespread appeal,” he said. “The data wouldn’t show or imply that so we had to test it. He might be a big data advocate, But Oczkowski said he’s always been concerned about consumer privacy. In the case of the Trump campaign, data used was with publicly available or collected via an opt-in process, such as polling. Moving forward, Oczkowski said he’s most interested in the immersive types of experiences data can foster at the cross roads of digital and physical experience. “What I’m going to find most interesting is taking and translating concepts in the digital space, into more immersive things, such as user experiences at sporting venues or a concert,” he said. “With things like Disney’s [Magic Wrist] bands.. we’re getting to the stage where we’re truly talking about big data. How we actually talk to people is where the innovation is going to be.